Discussion in 'Graphics Cards' started by Kaapstad, Aug 14, 2017. @HEADRAT again. Try lowering your P6 and P7 state to 1500mhz, leave voltage alone. If it crashes, I reckon your cards faulty due to not running being able to run stock boost speeds. You could also try running the card at stock settings, and if it still crashes all the time, then I think its rma time. These are stock settings for the Liquid version. If it crashes using these settings, then it could be a hardware/software issue which you would need to debug. Software: OS, Drivers/Third party software. Ahha, apologies HEADRAT, I thought you had an air cooled vega 64. 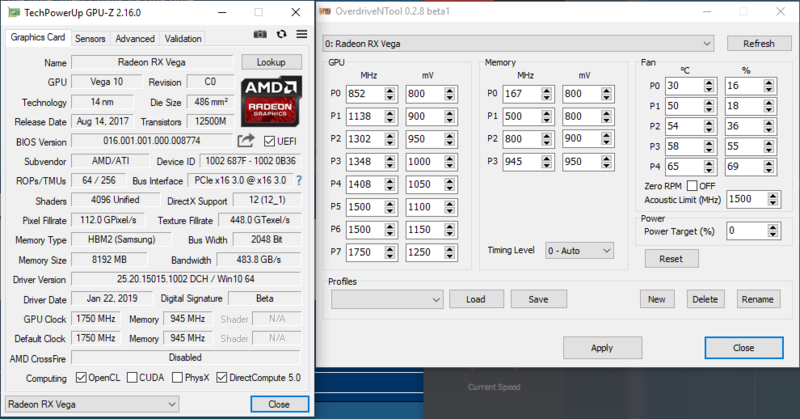 I have a weird issue with the latest drivers on my air-cooled Vega64; my monitor loses signal from the card when I exit a full-screen application. (Turning the monitor off and then on again fixes the problem, but it is annoying) Does anyone else experience this, and is there a fix? No, my monitor isn't a freesync monitor. @HEADRAT Looks like it could be a dud. Not all came out equal unfortunately. It's using the same BIOS I have and running settings way below mine and still crashing. However you still have all P States active. Can you try to disable P0 through to P6 on core and P0 through P2 on HBM2 and see if it runs with it locked to max power states. Test with Stock settings. So first I thaught this might be a new driver bug , my monitor would flicker than a floating box appears saying that monitors resolution is not optimal.This would happen whenever I started superposition but not actual games.When I turned off freesync it stopped.I tried again with freesync on and it doesnt happen anymore. What driver version are you on? Im on 19.1.1 stable adrenalin. I am on 19.1.2. I have tried 18.12.3, 19.1.1, 19.2.1 and all of them gave me the same problem. I will play around with the monitor settings and see what happens I guess. Forgive my ignorance, how do you do that? If you click on the actual P0 or P2 or P4 etc. writing in OverdriveNTool it will fade out and be inactive. ok I know your system is not o/c .. but what board and what mem cpu are you using ? 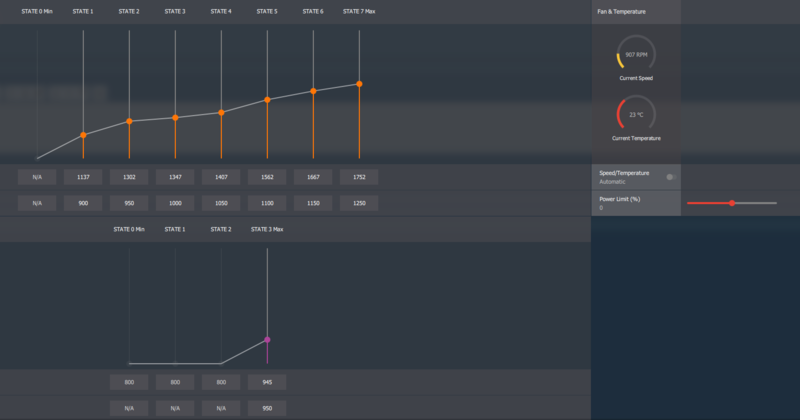 As I posted in another thread, I've been having a problem undervolting my reference Vega 64 (air). If I first reset all the settings in Wattman, then start with a clean undervolt I can get my card stable with all states from p1 to p7 at 950mv. I can have Heaven running for a long time and HWinfo or GPU-Z shows GPU VDDC as 950mv, and the GPU Chip power is around 170W. The clocks will remain steady around ~1500mhz give or take a little. I leave HBM as is at 945mhz. After exiting Heaven (or whatever game or benchmark I ran first) then try another benchmark or game then suddenly the GPU VDDC gets stuck at either 1050mv or 1100mv and the power consumption goes up to about 230 or 240W on average. 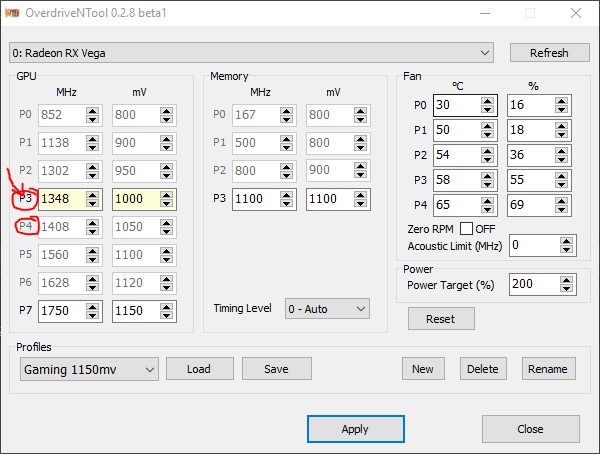 If I try changing voltages or clock speeds in Wattman or OverdriveNTool nothing effects that VDDC and it just stays at either 1050mv or 1100mv. Even resetting Wattman to defaults at that point doesn't do anything and the VDDC value stays the same. Reboots or shut downs don't do anything either and it's only until I force the card to crash by setting some really high clock that everything goes back to default. Does anyone know what could be causing this, and if there is a way to prevent the core voltage (VDDC) getting stuck at a certain value? Seems to hold 1600mhz in games unflinchingly with no more than 1400 RPM from fans - basically dead silent, certainly can't hear them over my intake fans. Could go all the way to 1100mhz HBM and it seemed stable enough in most benchmarks & games except for Odyssey, but since that's all I play lately, it had to go back to 1050. Also had success with 1075mhz but meh. Had some lower voltages & higher clocks OCs too but forgot them now, not too sure it would've been as stable anyway. Holds 40+ fps in Odyssey @ 4K Max (-clouds), which is not bad at all. Unfortunately the game has texture streaming issues which I can't get to the bottom of no matter what, but I guess Ubisoft's moved on now and put the team on the next AC. Was hoping for some HD Textures but alas, was not meant to be. Forgot if I gushed about this or not but HBCC is love, HBCC is life. I just wish most games weren't so neutered texture-wise!